Bringing a taste of the Mediterranean to Munich, Lemoni is a bright and cheery womenswear and gifts boutique owned by Katrin Tewes. 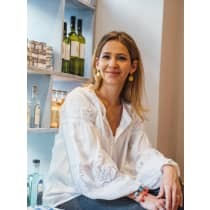 Originally hailing from Greece, Katrin wanted to spread the word about her country's design prowess to her new home, so decided to open a boutique selling almost exclusively Greek produce. Visit the boutique and you may even be lucky enough to meet Phoebe, Katrin's shop dog (who is also - coincidentally - Greek). "I mainly stock Greek brands that sell items produced in Greece - for me, this is a way of ensuring quality and ethical production. I know almost all my suppliers personally and there´s a lot of skill that goes into the handicrafts I sell."